The yellow tutu was a friend's daughter's idea! I was telling her about Autumn wanting to be Ming-Ming back during the summer and she said that it would be too cute if Autumn wore something like this. A couple weeks later, I had to get Autumn's ballet things and went to the site's clearance shop. They had this awesome costume for a ridiculously low price so I got it figuring it could be part of our regular costume stash after Halloween. The cape was so easy. I used the cape craft from the Nick, Jr. site so that the emblem would be right. I do need to sew the velcro onto the cape rather than rely on the adhesive. We lost one velcro disk. That was the only problem with the cape last night. It's sturdy and, since I made it out of fleece, it's warm. 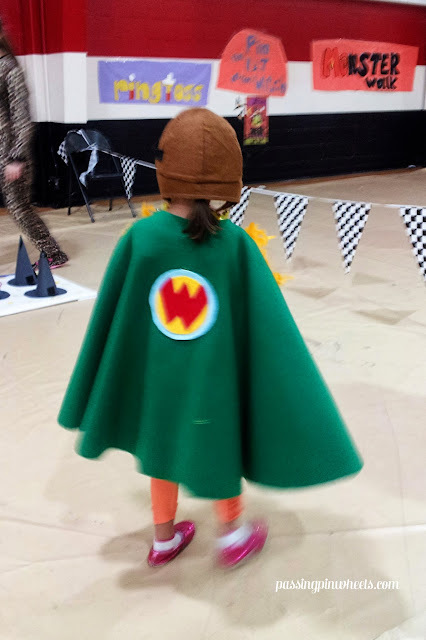 I don't have a photo of it yet, but I even made a tiny Wonder Pets cape for Autumn's kiwi doll Kiri. I decided not to bring my big camera to Funny Bones and, of course, I regret that so much. This cape photo is not amazing. I decided to make some wings for Autumn. The tutu was too scratchy for Autumn's taste so I went with an idea I found on the Better Homes and Gardens site. 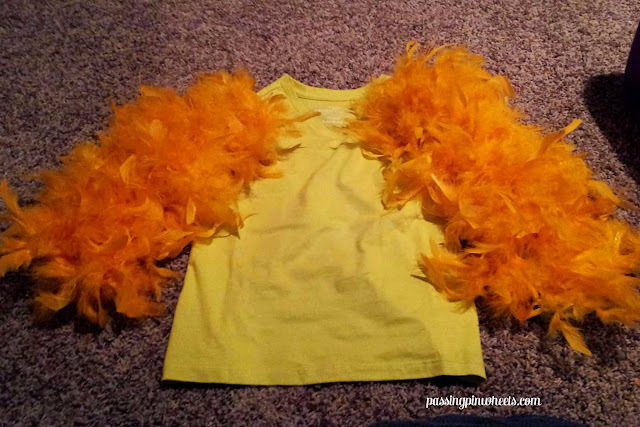 I found a super cheap yellow shirt. That was harder than anticipated! I eventually found it on sale at Walmart which wasn't the most fun shopping trip I've ever had in my life. I avoid Walmart like the plague! Well. Any giant stores, really. I did this under a blanket because it was unseasonably cold last week! And I am a major baby about cold weather so I broke out my electric blanket. Back to the wings...I cut the boa in half. I decided that rather than potentially restrict Autumn's arms by wrapping the boa around the sleeves like I initially planned, I zig zagged the boa over the top of the sleeve. 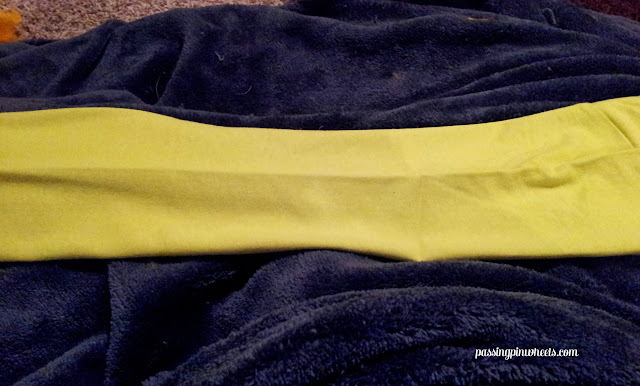 I flattened the sleeve on top of my blanket first so that the seam was in the middle on the bottom and the crease in the middle on the top. See above picture because I think the benadryl I just took is impairing my explanation abilities, haha. Fall is my allergy season! I used a cup to fill the sleeve as I glued to make sure I had the right shape. I glued where the big dots are until I got to the end of the sleeve and then I went back to make sure the coverage was right. I had to fix a spot on one sleeve but it wasn't a big deal. The glue hadn't set long enough to keep me from removing it. 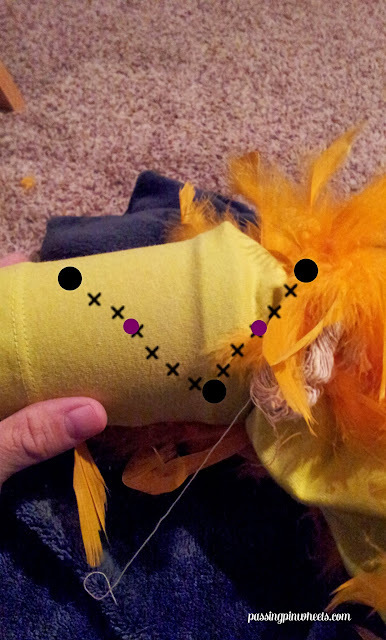 Once the feathers looked right, I went back to glue at the purple spots for reinforcement. I think sewing would work, too, but it would take longer. It turned out really well. 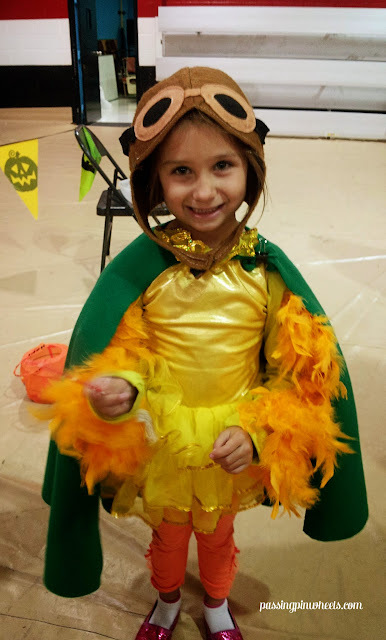 We were cracking up at Autumn flapping around the festival and, once, someone saw her and broke out into the Wonder Pets theme song! It was sooooo fun. Here we are together! 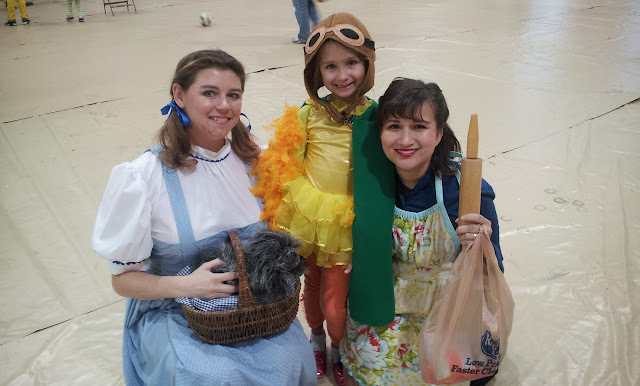 Christy came as Dorothy, I was a 50's housewife (I will be way better coiffed on Thursday!! ), and of course we have Ming-Ming. Rob, Elyse, Micah and Liana joined us, too! Super fun and it isn't even Halloween yet! Do you like my plastic bag? I forgot Autumn's bucket so Mimi rustled up that bag from somewhere so I wouldn't have to stuff my apron with candy! Submitted to Skip to My Lou's Made by You Monday! Lost for Words calendar plus a fitness pic!